A few years ago Michael Waldman at Baruch Library was kind enough to recommend what he described as the least intimidating marathon training book, The Non-Runner’s Marathon Trainer, which introduced me to Mihaly Csikszentmihalyi’s theory of flow, as applied to long distance running. I learned that flow, an intense state when you’re fully engrossed in an activity, is usually attained when you challenge yourself to go beyond your skill level, but not so much that you’re intimidated (see graph). Image: Oliverbeatson at English Wikipedia. Flow makes me feel radiant! 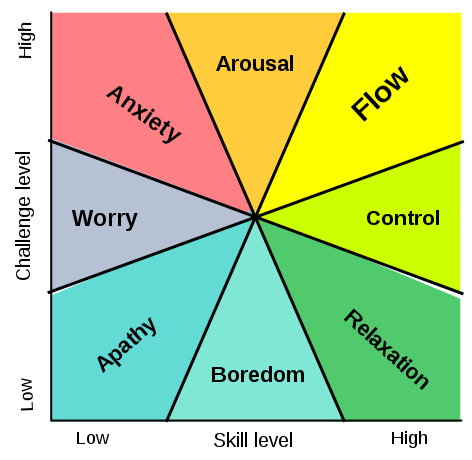 So I look for opportunities to achieve flow whenever I can, whether it’s in my personal or professional life, including my teaching. In fact, I’ve noticed that some of the most memorable experiences I’ve ever had as a student were when I experienced flow in a fun and immersive environment through a creative assignment or a game of some sort – as part of a junior high school moot court defense team or as an adult learner when our teacher tested our class’s knowledge of a unit (on some rather dry material: intergovernmental legal documents) using a Jeopardy-style game complete with prizes! So, I have long believed in the power of gaming (table-top games, role-playing games, video games) for educational purposes. And while I’m by no means immersed in the gaming world, I’m an advocate. A few years back, I was at a meeting where a student was demonstrating an online role-playing history game for a room of educators. I overheard one professor at my table privately question the educational merit of playing the game, which seemed to her to be a matter of mindless clicking to advance to another screen, with no intellectual rigor behind it. Sometimes when gaming is used in pedagogy, it’s frowned upon because there is an impression that it’s superficial or gimmicky. So I raised my hand and asked the student to explain whether players would need to have a foundation – to draw from a knowledge base – in order to make decisions about how to proceed in the game. He agreed that they did and explained how. The educator may not have been converted or even convinced, but I felt that gaming’s merit scored some points that day: games can enhance and foster learning by providing an engaging and relatable environment in which students can reflect on subject matter. And yes, games do provide opportunities for thoughtful, critical thinking. One of the most enthusiastic students left an impression on me by telling me that she didn’t know whether I just had a keen eye for knowing which students would click, but she was very surprised that she wound up becoming fast friends with her teammates. While I’d like to take the credit, it was actually a lucky confluence: all the students were also registered in a second writing course, making them a learning community, so these friendships would have developed sooner or later as a matter of course. However, one thing is certain: this type of group work and role-playing game helped cement some of those relationships. So, I think another added benefit of gaming of any kind is that it can encourage dialogue and camaraderie. Beyond all the intelligent, nuanced, incisive arguments and reasoning that went on during the course of those two weeks, I could tell that the students were also having fun. Students owned their personas and took pride in the arguments they would present. They created professional looking PowerPoints, used music, asked for audience participation, and they dressed up as King Ferdinand, Queen Isabella, and even the Pope! Playing makes learning more fun at any age and gaming is a great way to foster flow in our students’ academic lives as well as our own. I was pleased, then, when I first came to CUNY and learned about The CUNY Games Network. I attended this year’s CUNY Games Conference 5.0 after a hiatus of a few years. It was a neat departure from the previous ones I’d attended, where the main presentation format was a panel or talk (the organizers had opted for this more participatory format before, but it was my first experience with it). 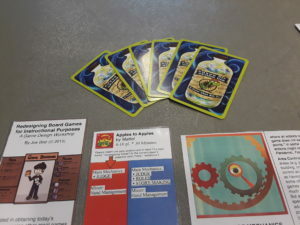 I attended the “Redesign: Modifying Tabletop Games for Instruction” workshop run by Joe Bisz and Carolyn Stallard, where we played the games “Apples to Apples” and “Snake Oil” and later discussed their mechanics and how we could use these to enhance our own instruction. During our discussion, we brainstormed a possible modified version of “Snake Oil” for a history course: the cards could be different historical figures studied during the semester and the dealt cards could all include other historical figures or resources that could help the historical figure advance in the game. We did not work out the specifics, but it would be a great game to play at the end of each unit to help students reinforce their knowledge and help them become more conversant and confident with the subject matter. My Snake Oil hand and other workshop resources at the CUNY Games Conference 5.0 in January 2019. In Bisz’s second workshop, we played his What’s Your Game Plan? A Game for Growing Ideas into Games, an actual table-top brainstorming card game available for purchase. We were asked to choose a lesson (normally, you would choose a lesson card in the course of the game) and we were then asked to create a game for this lesson using pre-selected cards that required us to use a specific game (Checkers, Jeopardy, Scrabble, etc. ), mechanic (movement/sport, jumping, role play, etc. ), and action (investigating, bluffing, trading, etc.). Each group at that workshop created the basic parameters of a game for different lessons in various disciplines. My flow-like experience with the history course students and the brainstorming at these practical workshops renewed my interest in incorporating gaming into library instruction. If you feel that you can’t possibly incorporate a game into your library instruction because you don’t have the luxury of teaching a 3-credit class, you’ll be happy to note that librarians have shown that this is totally possible in a one-shot library class. City Tech Chief Librarian Maura Smale modified Bisz’s brainstorming game and Tiltfactor’s Grow a Game to come up with the open access Game On for Information Literacy, which has been used by CUNY librarians to create a game that could be used in one-shot classes learning MLA citation style. CUNY librarians have also created a rubric for different information literacy games that can help us as we create games of our own. Do you have or know of an info lit game that can be incorporated into a one-shot class that you’d like to share? Let me know (ddominguez@ccny.cuny.edu) and if there is enough interest, I can put together a gaming for into lit flow toolkit to share! This entry was posted in General and tagged gaming. Bookmark the permalink.